I met Brent while on active duty at Camp Shelby, Mississippi. We shared so many things in common it was as if I had met a new brother I didn't realize I had. In fact, any number of people referred to us as "twins", a comment that pleased me greatly. Brent was always a "go-to" guy for all aspects of our job. 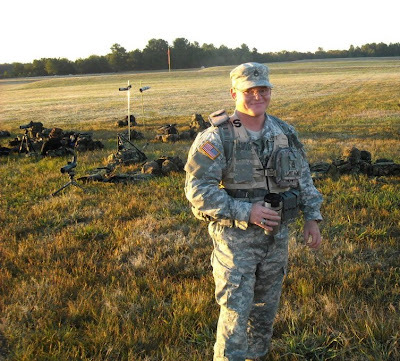 His vast knowledge culminated from nearly two decades experience with the National Guard and Army Reserve on a variety of shooting teams and marksmanship training units. He was instrumental in helping me find my way onto the USAR Shooting Team and was a very patient mentor. His interests were impressively diverse. Brent was a talented musician and played guitar in a number of bands. After I had stopped playing music in High School, Brent is the reason I took up it up again. He was an immense resource on a variety of topics. My most cherished memories at Shelby are of our long conversations over pots of chicory coffee on the back deck by the creek outside the cabin we shared. He commented that I was one of the few people he could stand to room with. It was an offhand remark made in jest (Brent got along well with everyone) but I took personal pride in it. Even after business and life separated us physically we remained in constant contact. I logged more cell phone minutes with Brent than any other person. He was always fun to talk with, and more than a great guy; he was truly a stellar human being. After being named NCOIC of the USAR Service Pistol team and helping me bring my scores up to make that team, I looked forward to future decades of continuing camaraderie. I was thrilled when I learned Brent was attending a training session at my then current duty station. And I was destroyed when I received the phone call that informed me Brent had been killed in a automobile collision and would never complete the trip. I don't feel Brent is gone. All the qualities that made him great, the helped me and helped the people who knew him be better are still there. So, this is not "goodbye." Rather, it's a "See you soon."